Ukuran pratayang PNG ini dari berkas SVG ini: 480 × 400 piksel Resolusi lain: 288 × 240 piksel | 576 × 480 piksel | 720 × 600 piksel | 922 × 768 piksel | 1.229 × 1.024 piksel. 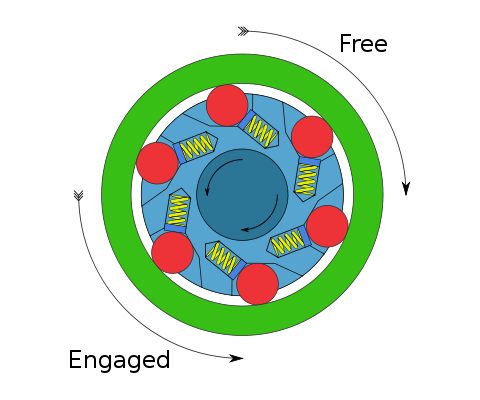 Diagram of a freewheel with arrows showing rotation direction and English notations showing which way is "free" and which way is "engaged". I'm not sure if the terminology (free and engaged) is correct so please correct it if it is wrong. This is a retouched picture, which means that it has been digitally altered from its original version. Modifications: Added arrows and text. The original can be viewed here: Roue libre2.svg. Modifications made by Borb.